Raphael Sanzio (1483-1520) was born in Urbino where his father was a painter. The Sanzio family members were personal friends to the Duke of Urbino whose palace was just down the street from the Sanzio’s fine townhouse. Raphael was a born painter; he could draw brilliantly while still a child. He studied with Perugino in Perugia and then went to Florence, the center of Italian painting at that time. 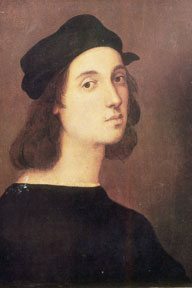 The teenage Raphael arrived in Florence carrying a letter of introduction from the Duchess of Urbino. His good looks and charming manner helped him to push into the competitive world of Florentine painting. Soon he was competing successfully with Leonardo da Vinci and Michelangelo. Yale University Press ($35.00) ISBN 0300040520.
his life and his works. Cambridge University Press ($16.95), ISBN 0521448999.